I love that so many of you asked about how Archie's adjusting to the new house! He is definitely timid of the new place, but is slowly gaining confidence. I hope he doesn't give Matt a hard time while they're home alone together! Why are they home alone? Because of my family reunion, of course! On the plane, ready for take-off! My childhood home. (We creepily parked at the end of the street until the car in the driveway left, then drove up to take a picture!) It hasn't changed at all except for the front doors. We flew in Tuesday and immediately went about spending our time wisely. 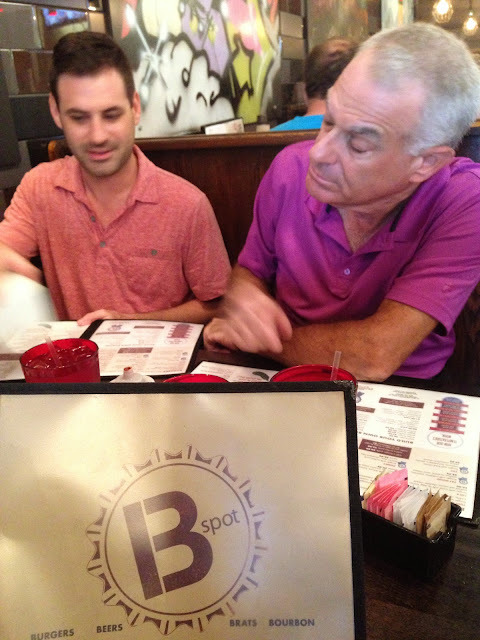 We grabbed dinner at B Spot, a Michael Symon restaurant. The burgers were so good, but if you ever go, order yours medium or medium rare; a few burgers at our table were overcooked. My burger is hidden under that amazing egg. Beef burger with pepperjack cheese, no bun, of course. Zach and dad taste the variety of sauces - dad looks unimpressed. 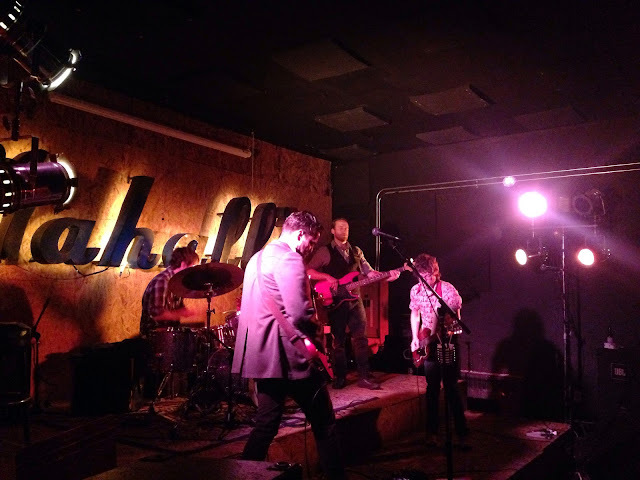 After dinner, Zach, Steph, and I went to Mahall's Lanes for a Patrick Sweany concert. He was discovered by The Black Keys and has a really eclectic sound, kind of rock/blues/country. I definitely need to make concerts a part of my life. Patrick Sweany, up close and personal. Today, I took advantage of the amazing weather and my nostalgia and went for a run - my first in ten days. After all the physical labor and exhaustion of moving, my legs felt amazing, but my breathing was a little rough. Still, it was a perfect run. I wish I had been a runner when I lived here. 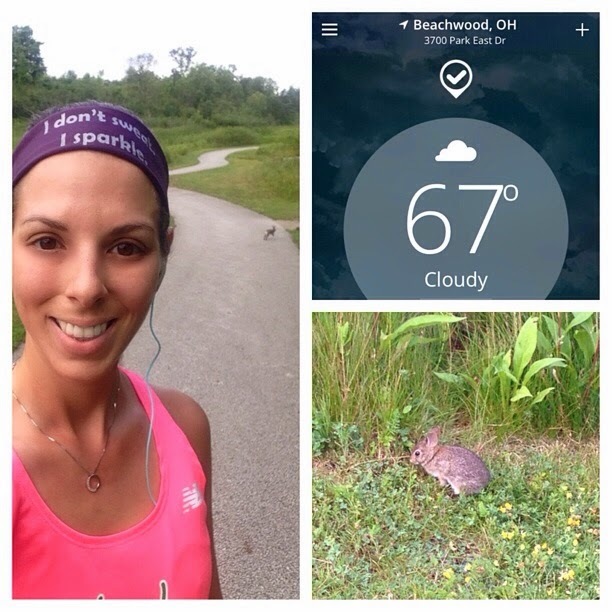 Beachwood has some perfect neighborhoods for running. Can you spot the bunny running away from me? Afterward, we kids went to the mall to pick up a gift for our cousin's "new" baby. (We're a little late...his son is already 4 months!) 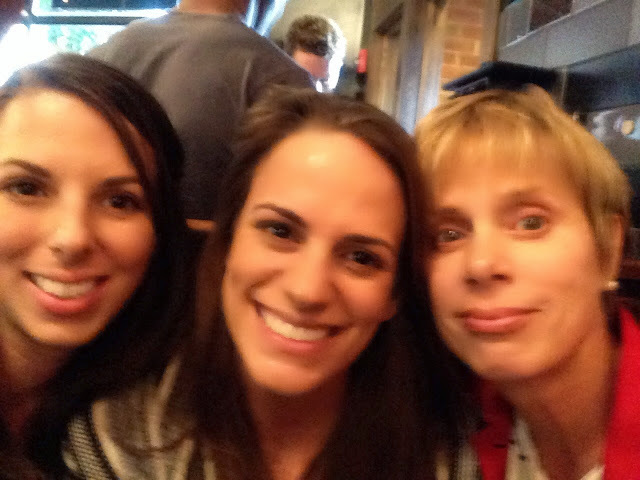 Then we grabbed lunch at Melt, a crazy grilled cheese restaurant owned by Matt Fish. Zach partially came on this trip just to go there, and when Steph and I found out they served gluten free bread, we were in. 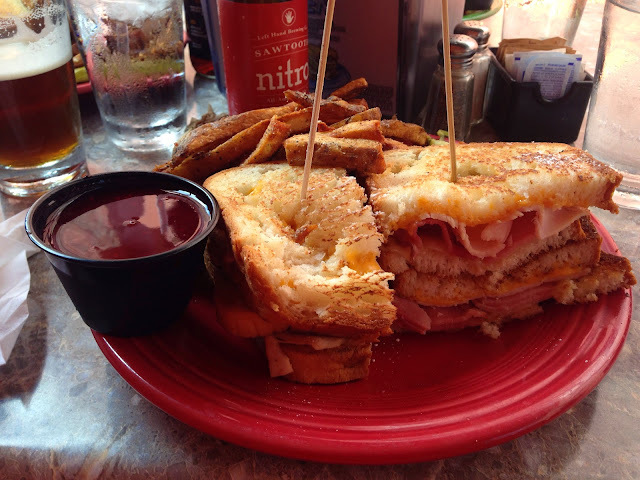 I got a gluten free (Udi's bread, not fried) Monte Cristo because it's Matt's favorite and I wanted to try it. SO GOOD. After lunch, we went to our grandparents' to hang out until dinner. 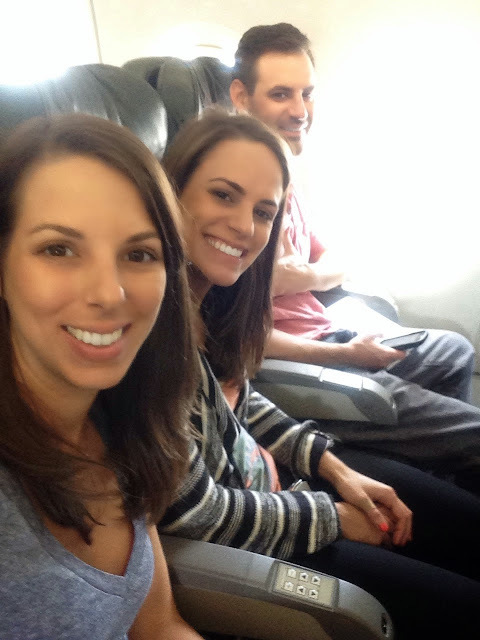 It's always bittersweet to see them because it makes me miss them so much, especially because we were so lucky growing up because they were always around, and now, of course, they're a three hour flight away. That, and they make us go around and call "dibs" on their stuff for when they die. Yeah, my family is totally casual about death, apparently. 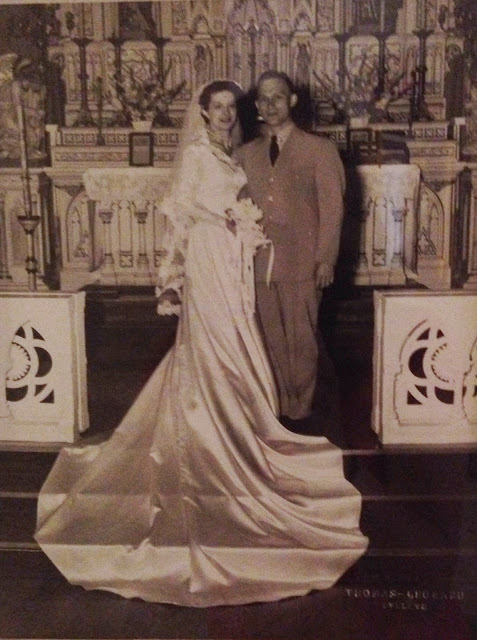 Grandma and Grandpa's wedding...62 years ago. Steph and I asked Grandma all about how they met and their dating life...I especially loved that she used the term "necking" lol. Dinner was...interesting. Let's just say there are quite a few differing political opinions between our generations and none of us is shy about voicing them. After a heated debate, we hugged it out, because that's what families do. 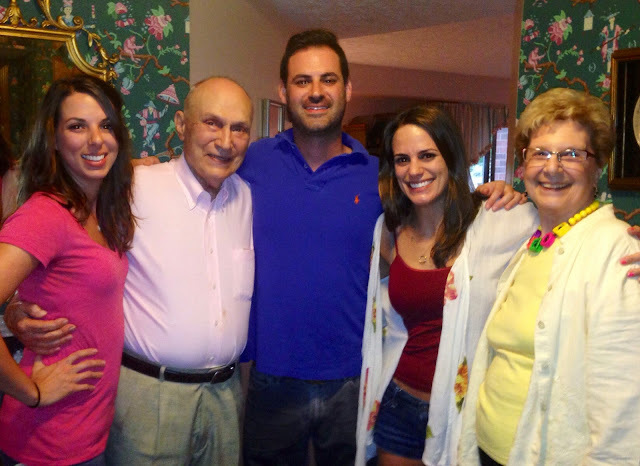 Us with grandma and grandpa! Tomorrow is the family reunion...this ought to be interesting. I hope you all have a great 4th of July and a wonderful weekend! Have you ever been to an extended-family reunion? Do you debate with your family, or try to keep things on neutral ground? What kind of grilled cheese would you want? It made a fabulous breakfast the next day, too! I've never had a family reunion before...I can just imagine the reminicing that happens. So glad that Archie is slowly settling in. 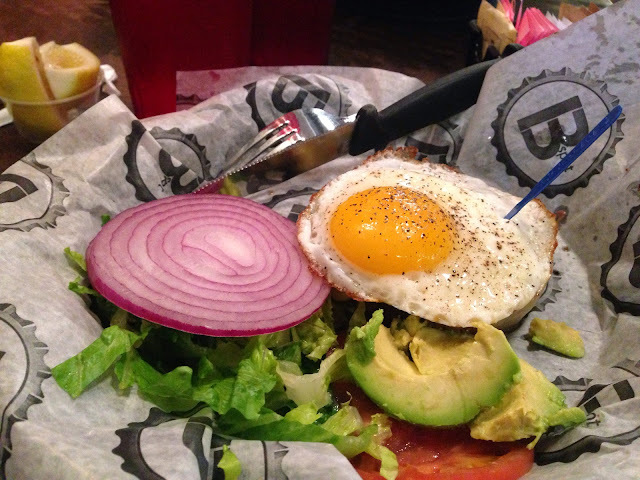 Egg on top of a good burger is one of my favorite things to eat! Who needs the bread when you can have an egg?! OMG poor Cecil! I can just picture him up on a shelf, stuck. Archie has been sitting in a main room and if you leave him, he just sits there and chirps until you come get him so he can go with us lol. I usually stop really far back and then sneak up on them when I see them! One of the baby bunnies I saw just hung out and didn't even try to run, though! 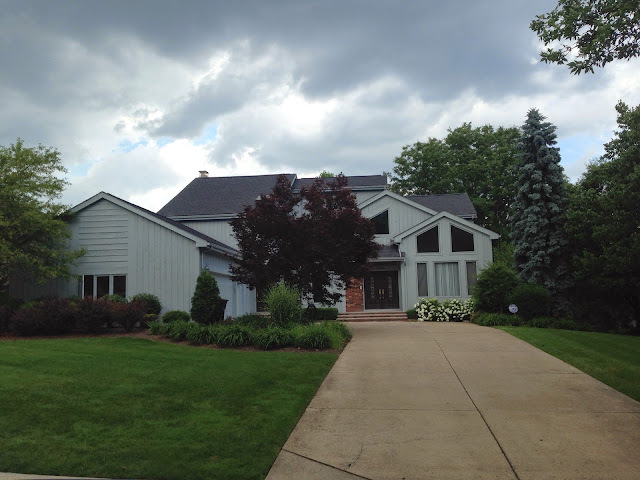 It must be really nice to still get to go home to your childhood home. I wish I could go inside mine but I think the strangers living there wouldn't approve lol. You have such a cute family! :) I actually had an amazing grilled cheese sandwich off a food truck here in Halifax! It had (a TON of butter on it but s'ok) with onion and apple jelly, with local ham and lots and lots of sharp cheese. Delish!! I LOVE food trucks, but we don't have them nearby! I've only had them in LA. Okay this is crazy- I was just up in Beachwood today and had B Spot for lunch, soooo good!! I'm home visiting my family in Kent for a few weeks! Small world!! I love meeting another Ohio blogger!